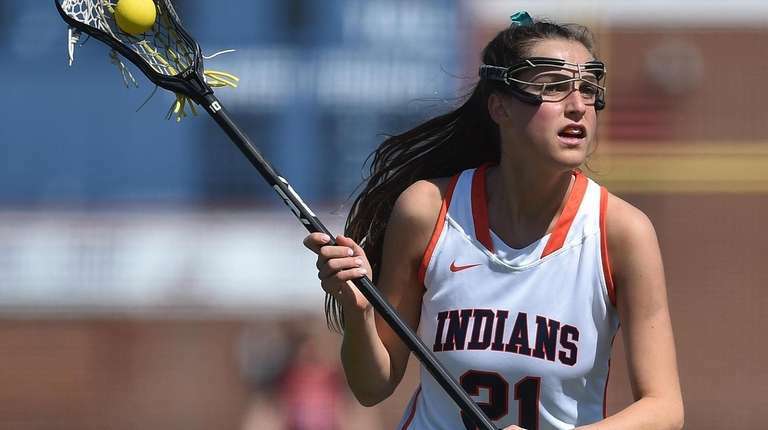 Recapping the week of April 15-21 in Long Island girls lacrosse, starting with a major shutout and finishing with other notables from a shortened week. All information is current as of Monday, April 22, at noon. Shutouts are rare in girls lacrosse. Shutouts are rarer against nationally ranked teams. That didn’t matter to Bayport-Blue Point. Off to a 7-1 start, the Phantoms reinforced their standing as one of the top teams in Suffolk Class C along with Westhampton and Mount Sinai. BBP's zone has confounded teams this spring, holding teams in its seven wins to 4.85 goals per game. 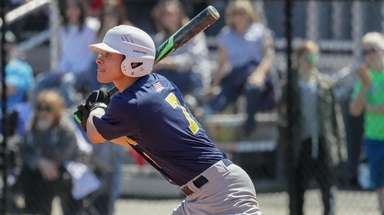 Eastport-South Manor netted 11 in BBP’s only loss. As a result of the win, the Phantoms shot up the Newsday rankings this week. 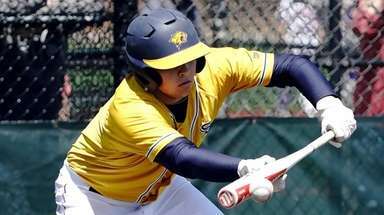 Their next big tests come on Thursday against West Babylon and Saturday against Riverhead. -- Alexandra Petras scored with 1:07 left in overtime to give Manhasset a 6-5 win over defending CHSAA champion Sacred Heart. Abigail Kolyer made eight saves. 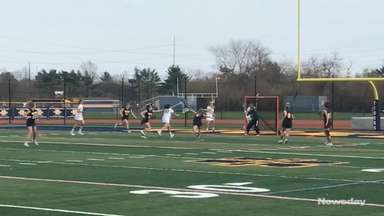 -- Summer Agostino’s free-position goal with 35 seconds left gave Ward Melville an 11-10 win over an upstart Bay Shore team in Suffolk Division I. Samantha Tarpey made 10 saves. -- Rachel Dickinson scored her fourth goal with two minutes left in overtime to lead Bellport over Kings Park, 14-13, in Suffolk Division II. Julia Longo tied the game at the end of regulation for the Clippers. -- Hollie Schleicher scored four times as Westhampton downed Mattituck/Southold, 10-9, in Suffolk Division II. -- Caroline DeBellis scored four goals — including the tying and winning goals — in Cold Spring Harbor's 12-11 win over St. Anthony’s in non-league. She tied it at 11 with 6:29 remaining then scored the winner on a free position with 3:37 left. CSH led 8-4 at halftime, but St. Anthony’s opened the second half on a 6-1 run to take a 10-9 lead. -- Michelle Ruzzier tied the game with 1:35 left then scored the winner 26 seconds later to lead Oyster Bay to a 12-11 win over Floral Park in Nassau Conference II. She scored four of the Baymen’s final five goals. -- Cassidy Moore had six goals — including No. 100 for her career — in Hampton Bays’ 15-13 win over East Hampton. -- Kailyn Hart scored 11 goals in North Babylon’s 18-9 win over Brentwood. -- Tamia Lawson had three goals, 11 draw controls and three caused turnovers in Bellport’s 14-13 win over Kings Park. -- Casey Gallagher made five second-half saves to secure Westhampton’s 10-9 win over Mattituck/Southold. -- Jamie Maddaluno had four goals and four assists in Mepham’s 13-10 win over Calhoun. -- Stony Brook lost to Columbia Prep, 13-10, but Ava McCormick recorded a school-record 12 draw controls, according to coach Vanessa Windsor. -- Isabelle Vitale had five goals and one assist in Cold Spring Harbor’s 12-11 win over St. Anthony’s. 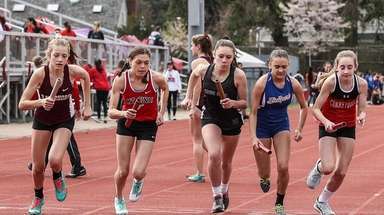 Syosset at Kellenberg, 11 a.m.
Smithtown East at Middle Country, Newfield High School, 10 a.m.
Riverhead at Northport, 11 a.m.
Bayport-Blue Point at West Babylon, 4 p.m.
Kellenberg at Long Beach, 10 a.m.
Smithtown East at Smithtown West, Sachem North High School turf field, 12:30 p.m.
Sachem East at Sachem North, 3 p.m.
Sacred Heart vs. John Jay, 2 p.m.
West Babylon vs. Bronxville, 4 p.m.
Middle Country vs. Rumson, 6 p.m.
Mattituck/Southold vs. Suffern, 1 p.m.
Eastport-South Manor vs. Darien, 3 p.m.
Mount Sinai vs. Moorestown, 5 p.m. Cold Spring Harbor vs. New Canaan, 7 p.m.